The French approach to fashion is the best packing rule: "A few good things"
I admit it: I'm a radical on this luxury travel issue. But I'm convinced that flying carryon is the only sensible way to travel. I'm not alone. Many luxury travelers feel that packing light and carryon-only is a hallmark of a genuine lux traveler, even when we're granted a free checked bag by our airline or credit card. And packing carryon is an obvious way to save the airlines' punishing baggage fees. We Learned the Hard Way: Don&apos;t Pack So Much! Many of us resolved to change our ways after a luggage-related mishap. Say, the time we made our connection, but our checked suitcase didn't, and we arrived in Cancun with only winter wool on our backs. Or the time the airline lost our luggage. Or that trip when we traveled with six bags and left one at the hotel's taxi stand, never to be seen again. Or we had too much luggage to take the train from the airport and spent a fortune on a cab. Or we took a weekend getaway, packed enough for 10 days, and feared for our sanity. Or maybe we're just sick and tired of dragging around half our wardrobe. Taking the carryon vow lightens your load physically, logistically, and emotionally. It's a joy to be fast on my feet when you travel. And many converts find that the rigor of packing light is a pleasant challenge, like a crossword puzzle, as well as a fashion exercise. Packing light is an art and a source of pride. There's a test of whether you've overpacked. If you can't walk a quarter-mile carrying (not rolling) all your bags, you have overpacked. (What's a quarter mile? Five minutes at a determined clip, six or seven minutes in a stroll. A quarter mile is five Manhattan blocks. And from one terminal concourse to another in a major airport. Airlines do uphold maximum dimensions for carryon bags. A carryon has to fit, more or less, into the metal "test racks" you'll see in airports for this purpose. Typically, length plus height plus depth cannot exceed around 45 inches total. Domestic flights allow more than international; check your airline's website. Whatever carry-on bag you choose, it should be easy for you to carry, pack, and unpack. Most travelers today like wheeled bags. Wheelies may be soft fabric or hard-shell. Collegiate or rugged travelers favor camping-size backpacks. I prefer an unstructured, zippered duffel that I can toss everything into and throw over my shoulder. It's a little weighty when full, but I like using my muscles. And if it's too heavy, I know I've overpacked. You're allowed two carryon bags. Make them count. One is your suitcase, the other your "personal item." Airlines are vague on their definitions of "personal item"; make their fuzzy rules work for you. So...go for it. Make your personal item a big tote, not a regular handbag or briefcase. It's supposed to fit under the seat in front of you, but this is an undefined directive, not a size limit If your tote can't be shoved into that space, it can be crammed into the overhead bin. You can put a lot in your "personal item." You can stash in your tote: your handbag and/or briefcase; your laptop/iPad and other devices; your inflight essentials, like an empty water bottle you refill in the terminal (more about all these below). Your travel handbag is a different species from what you usually carry. Your day-to-day bag at home is probably a heavy, structured, fashion bagm not made for travel. Travel handbags serve a different purpose. At their best, they're easy to carry, roomy, and secure. Your ideal travel bag should be large: big enough to fit everything you need for a day's worth of touring, including a water bottle, pashmina, phone, and more; lightweight: in nylon or other fabric, or a lightweight leather; streamlined: this is not the time for chains, buckles, fringe, and other weighty design details; designed with handy pockets and zippered pouches; crushable; easy to carry; with a zipped closure (an open bag is an open invitation); and with secure straps. A shoulderbag or crossbody style is best -- no clutches or dainty Queen Elizabeth handled bags that can be grabbed right out of your hand. Think: soft leather hobo bag, multi-pocketed nylon bag, messenger bag. Le Sportsac and Kipling make excellent fabric shoulderbags. For dinners and evening events, you can pack a small, dressy, lightweight fabric bag that zips. 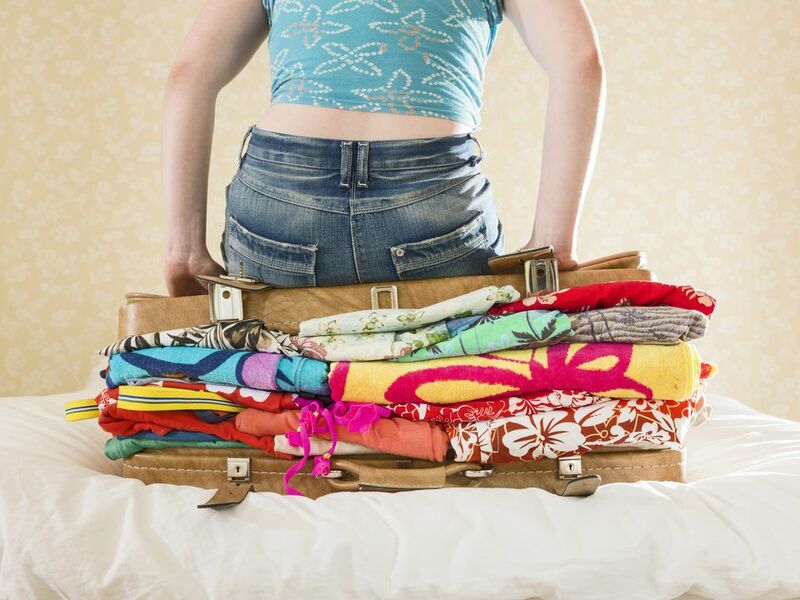 Your suitcase is not your closet! Packing is triage. Focus on what's essential. Bring what you need, not what you think you might need if, if, if... And not necessarily your favorite garments, but your most versatile. The moment of truth: will you wear it at least twice? Mix-and-matchable selections go farther, and remember: you can hand-wash most fabrics in your hotel-room sink. I pack one each: jeans or well-fitting cargoes; yoga pants or Chilly Jilly lounge pants (worn on the plane); hoodie or cardigan (I wear my black cashmere Nike hoodie on flights); long-sleeve cotton or thermal top (air-conditioning can be frosty in the tropics); a silk or other lightweight top; black silk skirt; print cotton skirt; sleeveless black dress in a lightweight, wrinkle-resistant fabric like jersey knit, crinkle cotton, or micro-pleated nylon (such as by Miyake Pleats Please or Babette San Francisco); lightweight designer dress for city vacation; gym tee and pants; swimsuit (two for the tropics) and thin-fabric coverup; sleep tee; a minimum of undergarments (so easy to hand-wash). Plus I pack these few accessories: pashmina (worn on plane); weightless silk scarf; cashmere knit cap for the plane and cool days; small fabric handbag for restaurants; small jewelry bag with costume baubles in one color only (such as silver, faux gold, or black Bakelite). Other items are dictated by location: crushable straw hat and sarong or beach coverup for resorts; silk cheongsam for China; tiny umbrella for rainy climates. And I pack a mini spray size of Downy Wrinkle Releaser Plus, which smooths clothes in one spritz. One-coat application! For a climate that requires outerwear, pack one all-occasion coat or jacket. My pick: an ultralight black nylon zippered jacket, quilted for cooler climates, by H&M, Zara, or Uniqlo. You won't have room to pack it, so unless it packs into its own mango-size drawstring bag, you'll have to wear it through security and onto the plane (where it can then work as a blanket or back pillow). Shoes, your heaviest and bulkiest items, can be a traveler's downfall. Don't let your footwear be more than you can bear. Here's how to winnow down your travel shoes to three pairs. The must-packs: fashionable sneakers that can double as walking shoes: designer sneakers such as by Geox or Adidas that look good outside the gym. Ladies one pair of lightweight heels for evening. They should be sensible enough to allow you to walk a few blocks, so you're not dependent on cabs. Ankle straps, platforms, chunky heels provide the most support. For warm climates: a pair of lightweight sandals you can walk in, even nice flip-flops such as Havaianas. (In steamy India, Southeast Asia, and Tahiti, jeweled flip-flops work well as evening shoes). Possible addition: snow boots for a ski vacation; in the American Southwest, sleek cowboy boots such as those from Santa Fe's Back at the Ranch work as evening shoes. (You'll have to wear these onto the plane to save bag space.) This entire travel wardrobe may sound like a lot, but it fits into one carryon bag with room to spare. There are other must-packs, because you can't count on even a true luxury hotel to provide absolutely everything for you. It's a good idea to pack: a universal charger for all your devices and a compact voltage adapter for Europe or Asia; your own music, whether on a phone, iPod, iPad, or laptop; a weightless nylon shopping bag such as by Rume for beach and shopping; a tiny bottle or stick of SPF; a mini bug spray for the woods or tropics; a tiny pot or stick of cortisone cream for the bites you get (FixMySkin makes these). Must bring a laptop? Make it lightweight. Ultra-thin, lightweight laptops and tablets are made for travelers. The MacBook weights under two pounds, with an 11" crystal-clear "retina screen." Pack an in-flight comfort bag, for convenience and sanity even if you're flying business class, where you'll be given an amenity kit. My in-flight bag is a see-through zippered mesh bag from Walker. It holds a combination of travel and grooming supplies: passport; iPhone; sunglasses; reading glasses and/or contact lens case; earplugs and noise-cancelling headphones, the brilliantly effective in-ear noise-cancelling models by Bose, wired or Bluetooth, that take up no space (I tote a pair even if I'm flying business class and will be lent a pair of headphones); fuzzy bootie-socks (plane floors are freezing) small pen for filling out customs forms. My inflight bag also fits: a tiny flashlight for hotel rooms and resort pathway); meds; a couple of bandaids; exercise band (basically a big rubber band; air travel accessories from Cabeau: a stay-on sleep mask, and for a long haul, a memory foam neck pillow and fuzzy blanket; a natural, all-purpose beauty balm that's like a toiletry kit in one 1.9-ounce spray bottle: CapriClear, a greaseless coconut oil moisturizer that revives your skin and hair; lip balm, like the hard-to-lose colorful spheres by eos; mini perfume spritzer by Travalo; minuscule plastic bottle of antibacterial gel such as those by GermBloc (also available on Amazon); small water bottle (empty going through security, refilled in the terminal). My travel wallet is a very small zippered pouch, the "Iconic Jen Zip") by Vera Bradley, with a clip. What you need in the wallet: cash, credit and ATM cards, airline and hotel VIP cards, medical insurance card, driver's license (for ID or for driving). Keep your passport close by and leave all your local cards and coins at home. See how English-born, Bahamas-residing model and designer India Hicks flies comfy & happy. And see how you can improve your sleep life inflight, at your hotel, and at home. Happy travels...light travels!